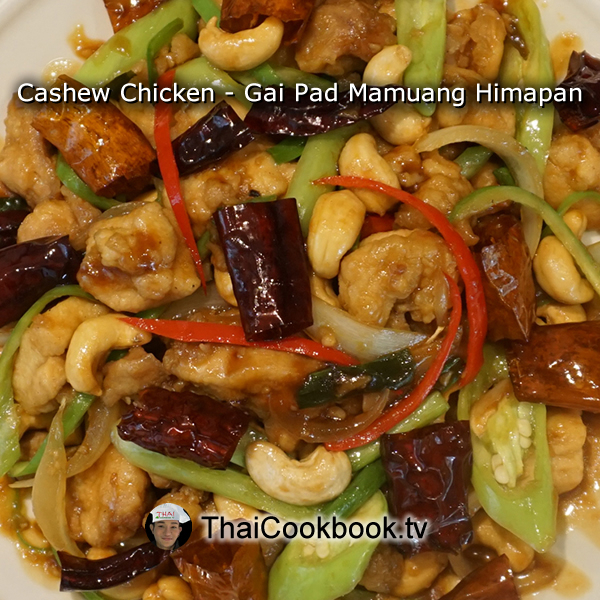 This Thailand style cashew chicken is simply bursting with flavor. 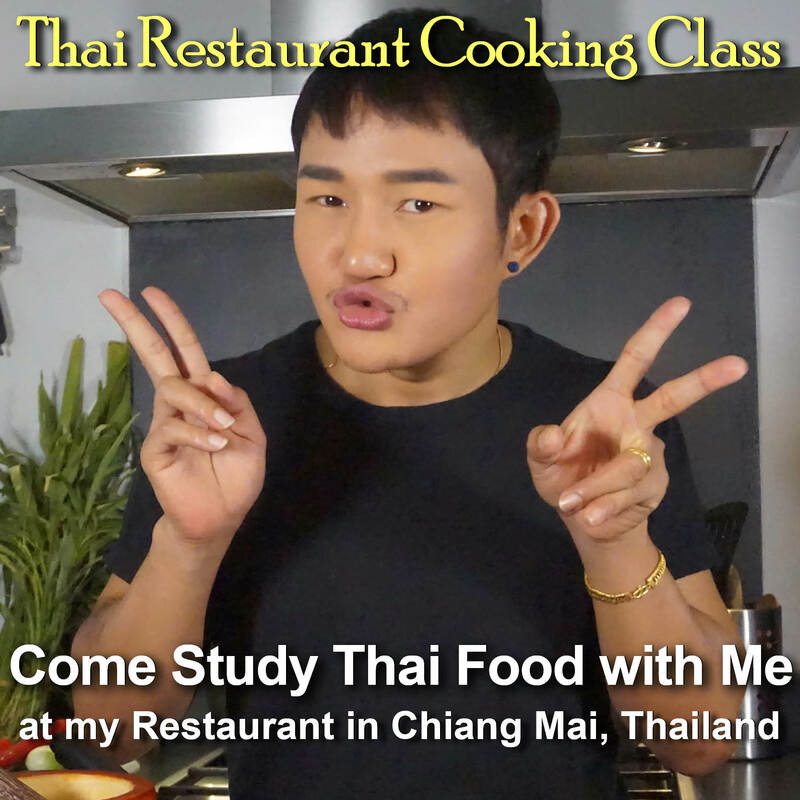 Big juicy chunks of chicken leg meat are stir fried together with healthy a portion of browned cashews nuts in a thick and sticky sauce, together with garlic, onions, mild red and green chili, green onion, and mild sun-dried chilies. 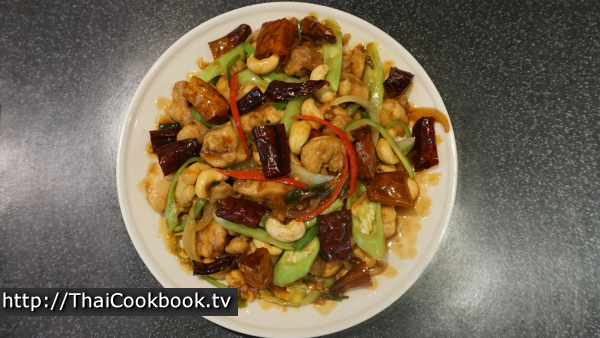 What's in our Cashew Chicken. 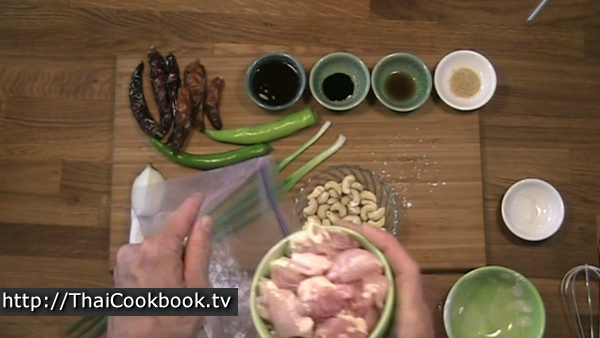 How we make our Cashew Chicken. 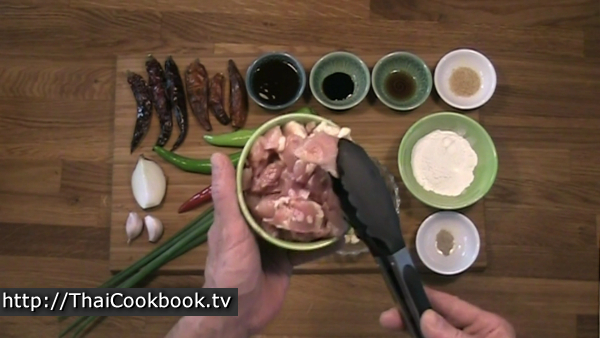 1) Remove the skin and bone from the chicken, and cut it into chunky pieces. 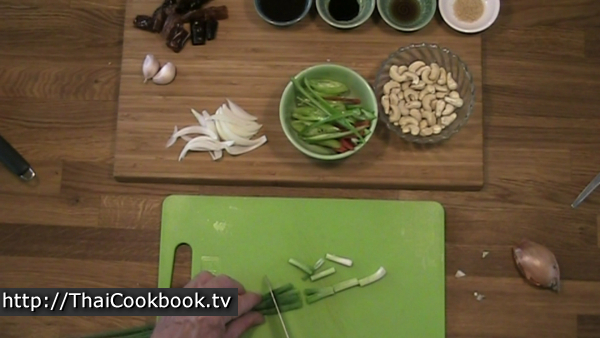 Cut the chilies, onion, and green onions, chop the garlic. 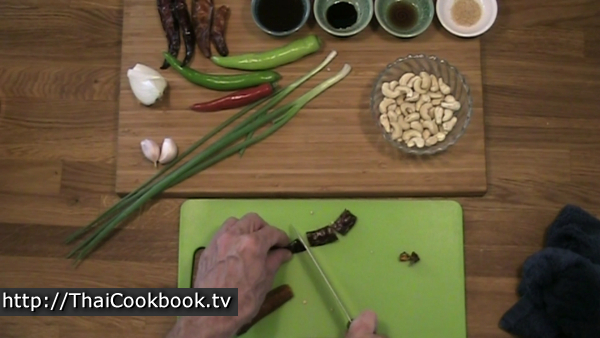 2) Deep fry the cashew nuts, the dried chilis, and the chicken. Remove and set aside. 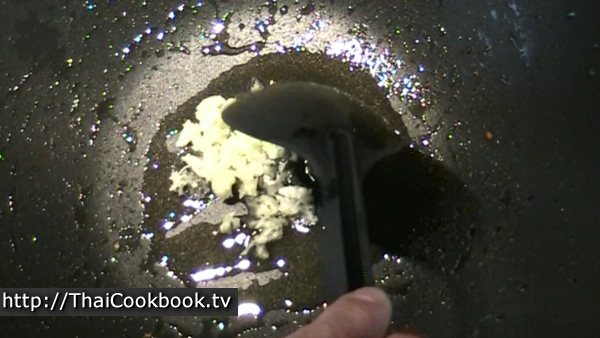 Pour the oil out, reserving just one tablespoon. 3) Saute the garlic and onion, then add the sauces and sugar with a little water to make a gravy. Add the fried chicken and stir until coated in the gravy. Fry for 2 minutes. 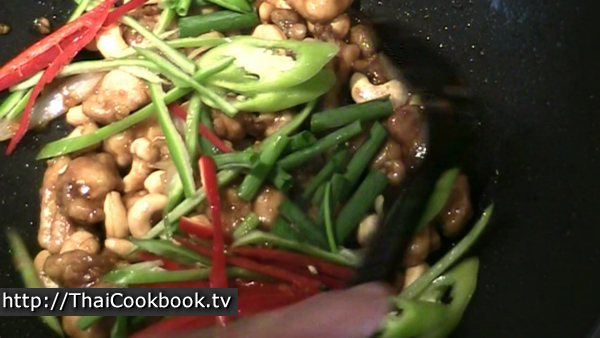 4) Add the fried cashew nuts and continue coking for a minute, then add the fresh chilies. Stir it up well, cook for 30 seconds, then plate. Serve topped with the fried, dried chili pieces. 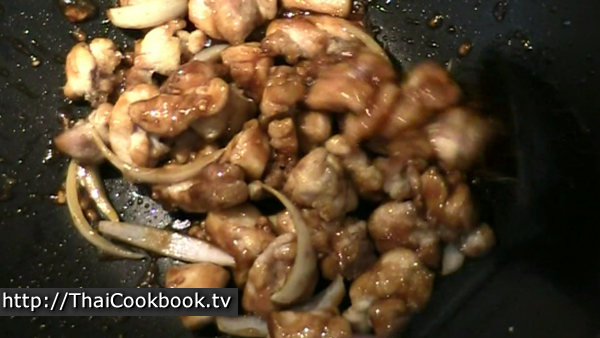 To make my cashew nut chicken I use chunky chicken leg meat with the bone and skin removed. 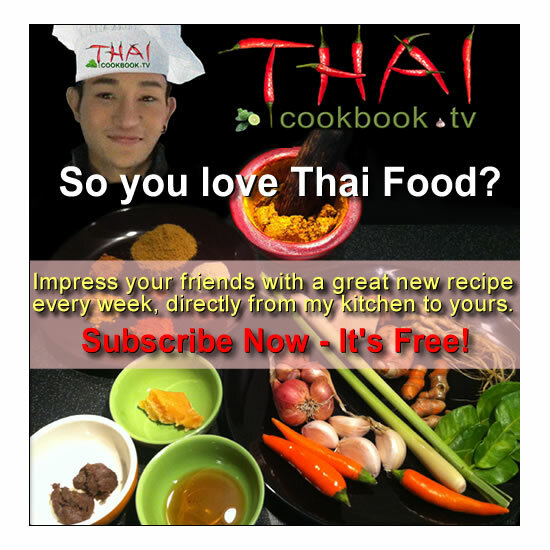 You can use chicken breast if you prefer it, but the leg meat will produce a much more flavorful dish. Whichever you use, just cut it into nice big pieces. I use both red and orange sun-dried chilies just to add more color. These are the Thai long chili, a mild but just a little spicy pepper that we have here. Mix the white pepper into the flour well, then put it into a large zip lock bag with the chicken and shake it up until the chicken is lightly coated everywhere. Cut the dry chilies into 1 inch pieces and remove the seeds so you just have little red pepper tubes. Cut the fresh green and red Thai long chilies in half lengthwise, remove the seeds, then cut them into long, thin strips. Cut the yellow wax pepper diagonally, and also remove the seeds. Cut the green onion into 1 inch pieces, slice the onion into little wedged slices, and chop or press the garlic very fine. 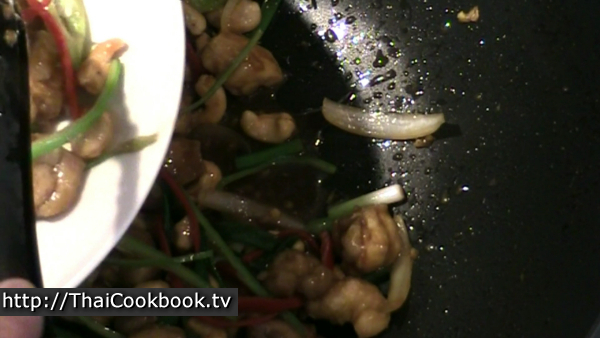 Heat the oil in a large wok or deep pan until just barely warm enough to fry. Add the cashews and fry them until just a little brown. It's easy to burn them, so watch the heat, keep stirring, and remove them when they just start to turn color. These took about 5 minutes, but it all depends on your pan and the heat. 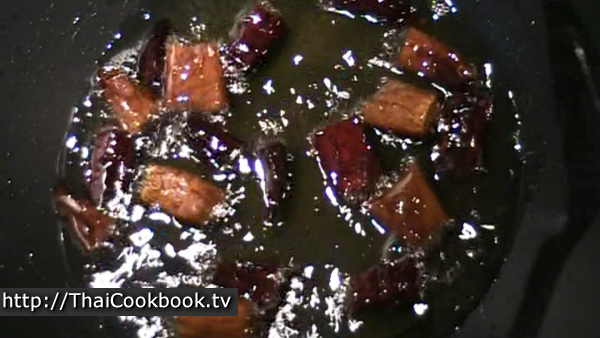 Remove them right away to a paper towel to absorb the excess oil. Next add the dry peppers to the oil, and be ready to remove them right away. It really just takes a couple of seconds. You'll see them flash to a brighter color and they are done. Any more and they will be burned. Next add the floured chicken pieces. Fry it on low heat for about 5 minutes or until the coating hardens up. This is not like fried chicken that will be well browned. You just cook it until the meat is done and then remove it all to a paper towel. Turn the heat off so the pan cools down all the way. Pour out almost all of the oil so you just have about a tablespoon, then add the garlic and fry it slowly over low heat for about 30 seconds. 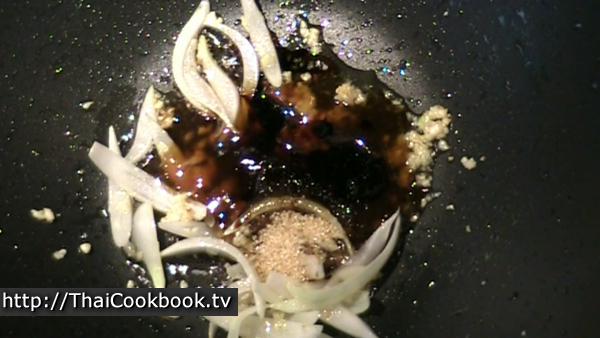 Add the sliced onion and cook it together with the garlic for about a minute, then add the sauces and sugar. Stir it up well, let it get hot and bubbly. 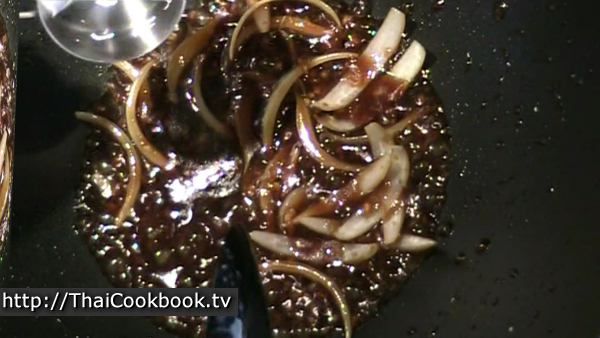 Add about 2 - 3 tablespoons of water, stir it in to make a thick brown sauce. Note that you want to maintain a little sauce all the time, so have more water ready and add it a little at a time as needed. Add the fried chicken and stir it all up until well coated in the sauce. Add a little water to get some sauce back, and turn the heat up high. Stir fry for about a minute until really hot again. 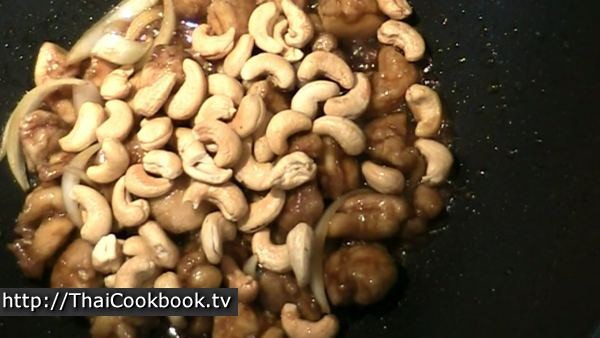 Add the fried cashews, stir them in, and continue frying for a couple of minutes. Next add all the fresh peppers, stir them in and keep frying. Add more water if needed. Fry for about 30 seconds, then turn off the heat. Keep stirring as the pan cools down. Serve it all on a large plate to be shared, or each portion on a small plate with some steamed rice for a delicious one-dish meal. 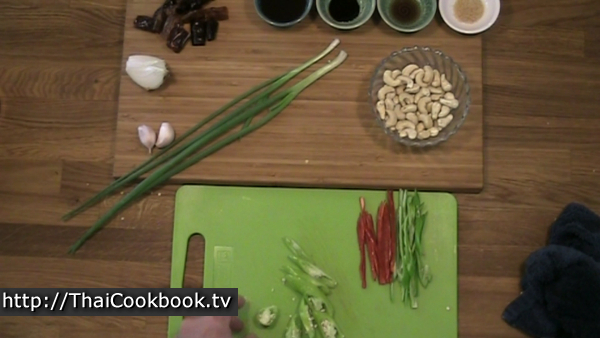 Arrange all the ingredients evenly, and top with the fried dry chili pieces.